DNS Accountants is a widely popular Accountancy firm based in the United Kingdom. DNS provides tax advice, accountancy and consulting services to start-ups, sole traders, freelancers, contractors and small businesses. From a one-man humble accountancy practice in 2005 to a major leader amongst accountancy firms, DNS has grown exponentially.The core team at DNS Accountants comprises over 90 employees who are highly dedicated and qualified to excel in what they are doing. DNS Accountants, reputed accountancy practice in UK, was founded in year 2005. Since starting days of the business, DNS accountants has been committed to deliver high quality, promising accounting & bookkeeping services for clients all over UK. Soon, the firm witnessed an outstanding business growth, from a one-man initiative into a multi award winning accountancy. During the period, DNS launched its own cloud-based online accounting software that received a warm response from businesses across UK. In year 2007, the business moved into a humble office space. With aim to become a full range Accountancy Services provider, we started adding great minds in the industry to our team. Hard work & dedication of team members resulted into high net worth clients’ acquisition and launch of new regional offices across United Kingdom. From year 2008 to 2012, DNS Accountants witnessed remarkable growth in terms of clients, revenue and business outreach in the UK. To serve the customers better, we set up a unique customer support system. The operations team including accountants, support staff & advisors has always been friendly and cordial to the clients. We believe that it’s our duty to ensure that queries from each of our clients need to be resolved and advising them the best in order to help them save maximum and increase profitability. With the launch of the exclusive accounting software for remote accountancy services, DNS Accountants received overwhelming response from customers and gained instant popularity alongside increased level of satisfaction for clients. A head office was soon established in Harrow in North West London. Today, DNS Accountants has its registered offices in multiple cities across UK including London, Manchester, Redruth, Wigan and more. Situated in North West England on the banks of River Mersey, Warrington is a major shareholder in the country’s economy. The main sectors of economic development in Warrington are retail and leisure. It has witnessed modernisation in the retail and commodities sector and despite strong competition from neighboring port cities and towns; it continues to be one of the major trade cities in retail. IKEA’s first store in England was set up in Warrington. The other main outlets in the region are Toys “R” Us, Marks and Spencer and Next. Various leisure attractions provide employment to a considerable crowd residing in the city. Gulliver’s theme park is one of these leisure parks amongst others. The majority of the employed population works in the administrative services or health services in Warrington. Our team comprises some of the best Tax Accountants, Online Contractor Accountants, IT Contractor Accountants, Small Business Accountants and Chartered Accountants in Warrington as well as other locations across United Kingdom. Excellent feedbacks received from our clients about our accounting solutions & services push our team of incredible Tax Accountants in Warrington to put their best efforts in their job. Amongst the notable ventures being introduced by DNS is our Business Start-Up Initiative. To bridge the gap between the highly competitive market and the new start-ups, DNS provides services of expert Small business accountants in Warrington who maintain all account related works for the start-up clients in lieu of a standard fee. What are the Services offered by DNS Accountants? What is Self-Assessment Tax Returns? For self-employed, sole traders or people working through a limited company, or employed with some other means of additional income, Self-Assessment Tax Return needs to be filed to account for the extra income. DNS offers a comprehensive service for the preparation of the Self-Assessment Tax Return for individual clients. We assure customers of flawless tax returns. Hence, chances of HMRC or Companies House bothering the client over inaccurate tax filing never happens if you use our Self-Assessment Tax Returns Service. The filing process is quite complex because of the wide range and specific format of information entry required, thus taking up a lot of time for the trader. Many clients end up paying a penalty for late filing of tax returns. Clients often don’t know which expenses are allowable and which are not. Clients are also unclear about how dividends should be shown on tax returns. Payments on Account reduction and Capital Gains Tax computation are also a complex affair for customers. Why DNS Self-Assessment Tax Service? DNS’s team of highly skilled tax accountants in Warrington is ever ready to clarify uncertainties faced by clients at any point of the procedure of filing tax returns. Our Tax team not only files clients’ tax returns, but they also deal with HMRC on clients’ behalf and helps them make full use of tax benefits, concessions, and exemptions. The service fees are fixed and standard, they are not hourly rates. Tax advice comes as an additional service with the filing. We assign a tax specialist to the clients to deal with the Inland Revenue on their behalf. How does the DNS Self-Assessment Tax Filing Service work? We will collect all relevant information about your company. Clients need to send a completed checklist along with supporting paperwork. DNS then files your tax return prepared from the information supplied. DNS delivers a draft to check with you. DNS files a self-assessment tax return with HMRC and keeps you informed about the status. DNS helps you save a lot of time and money and makes the complex procedure mostly hassle free. DNS also provides services to cover the insurance for when a client is being investigated for tax fraud or inaccurate filing of tax. We take care of all legal procedures in these cases, with a minimal service charge charged from the customer. The monthly fee is a standard one too. Even if there has been no fraud from a company’s side, the HMRC may issue an investigation warrant against your business based on your successive years’ tax returns. To ensure that the legal procedure for this does not take a toll on the company’s monetary value and the post-holders’ time, DNS provides easy Tax Investigation Cover for clients. Businesses in Golborne, Runcorn, Leigh, Prescot, Northwich, Liverpool and Chester in Warrington are very popular users of DNS services. 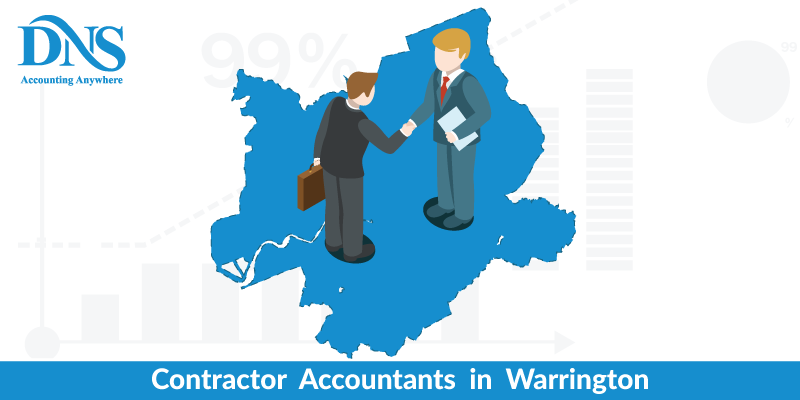 DNS is no doubt one of the most popular Contractor Accountants in Warrington. This service is easy, hassle free and profitable to use. The client is set up through our online accounting portal. After set-up, our IT contractor Accountants in Swindon have access to real-time information about the company performance and returns which are primarily used to maintain management accounts. Our Chartered Accountants in Swindon modify the management accounts services to meet the clients’ requirements. Businesses in Fairford, Newbury, Bath, Trowbridge, Chippenham comprise the majority customers of DNS in Swindon. DNS is no doubt one of the most popular Contractor Accountants in Swindon.